Premium collected by insurance companies has increased by Rs 36,848 crore, while the number of farmers covered has increased only by 0.42%, according to RTI data obtained by The Wire. 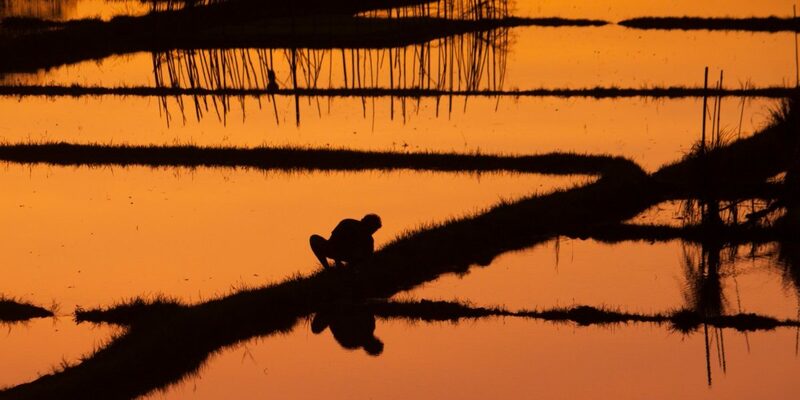 New Delhi: In January 2016, Prime Minister Narendra Modi launched a revamped crop insurance scheme, his government’s flagship scheme for farmers, the Pradhan Mantri Fasal Bima Yojana (PMFBY). It would “bring about a major transformation in the lives of farmers”, Modi had said at the time. However, after the implementation of the PMFBY, the number of farmers covered by crop insurance has gone up only by 0.42%. On the other hand, premiums paid to insurance companies have increased by 350%, according to data that the Ministry of Agriculture and Farmer’s Welfare provided to The Wire under a Right to Information (RTI) application. When the government announced the new scheme, it said that the PMFBY “incorporates the best features of all previous schemes and at the same time, all previous shortcomings/weaknesses have been removed”. It claimed that farmers will have to pay lower amounts as premium and that through the use of technology, the government will ensure ‘quicker settlement of claims’ compared to the previous crop insurance schemes. For the two seasons that the PMFBY has been implemented (2016-17 and 2017-18), insurance companies – private and public – collected a gross premium of Rs 47,408 crore. Total claims paid as on October 10, 2018 was Rs 31,613 crore. For 2014-15 and 2015-16, when the National Agricultural Insurance Scheme (NAIS) and Modified National Agricultural Insurance Scheme (MNAIS) were operational before getting subsumed under the PMFBY, the gross premium collected was Rs 10,560 crore. And total claims paid, at Rs 28,564 crore, was in fact more than the premium collected. Source: RTI response of the Ministry of Agriculture and Farmer’s welfare dated October 10. 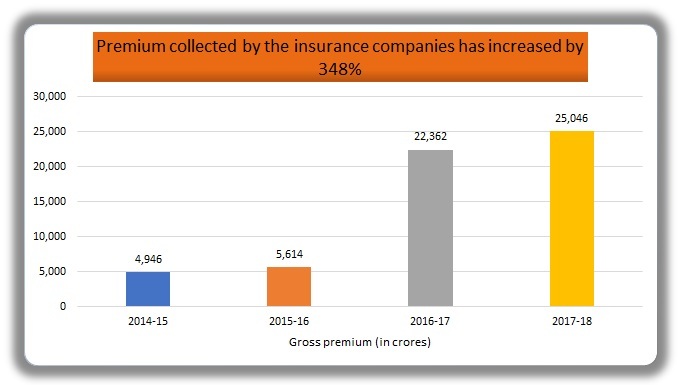 So, under the PMFBY, gross premium collected increased by Rs 36,848 crore or 348%, but the coverage has remained pretty much stagnant. In 2015-16, before the launch of the PMFBY, 48.55 million farmers in India were enrolled in the existing crop insurance schemes. By the end of 2017-18, two years into the PMFBY and despite insurance companies having collected Rs 47,408 crore as premium, the number of farmers covered by crop insurance has increased by only two lakh, or 0.42%. 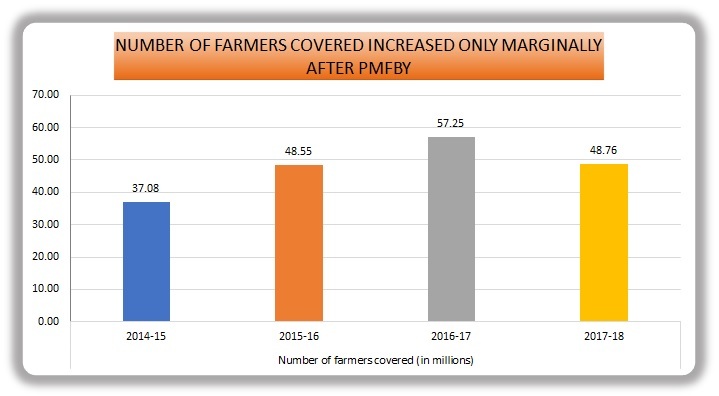 In fact, during the first year (2016-17) of the PMFBY, the total number of farmers covered increased to 57 million. But in the next year (2017-18), the number fell to 48 million, a drop of 14%. Signalling that farmers’ initial expectations regarding the benefits of the scheme were not met, a large proportion – of those who could, since enrolment in PMFBY is compulsory for farmers who take crop loans – opted out. Similarly, the total crop area insured has increased from 46.39 million hectare to only 49.04 million hectares after the implementation of the PMFBY. And as in the case of number of farmers insured, the coverage area also declined between 2016-17 and 2017-18. Compare this with the target that the Modi government had set for itself – bringing 100 million hectares under PMFBY by 2018-19. The target remains as far as it was when the scheme was initiated. Responding to a question in the Rajya Sabha in August, the minister of agriculture and farmer’s welfare admitted that there had been a decline in coverage. He stated that “announcement of Debt Waiver Scheme in Maharashtra and Uttar Pradesh, farmer’s perception of mitigated risk in 2017-18, which was a good monsoon year, deduplication due to Aadhaar being made mandatory for coverage etc.” were the reasons. Despite the fall in the number of farmers insured and coverage area, the total premium collected by insurance companies has not fallen. It has actually increased. In 2016-17, the total premium collected was Rs 22,362 crore. This went up to Rs 25,046 crore in 2017-18. The average premium per farmer went up by 31% to Rs 5,135 in 2017-18. According to Siraj Hussain, former agriculture secretary and now a senior fellow at the think tank ICREAR, more detailed analysis of data at the state level is required to pinpoint why premiums have increased. “We have to look at data and analyse the state and the crops where the premiums have increased. But, in principle, if you add more conditions e.g. cover for crop damage due to stray animals and penalties proposed in PMFBY modified guidelines 2018, the companies are likely to take such factors into account while quoting the premium rates,” he told The Wire. In the two years that PMFBY has been in place, total claims paid to farmers have increased only marginally, despite the total premium having increased by more than 4.5 times. For the two years before PMFBY, farmers were paid total claims worth Rs 28,564 crore. For the two years after PMFBY, the data provided by the ministry shows that total claims paid have only increased by 10% to Rs 31,613 crore as of October 10, 2018. Thus, the surplus for insurance companies till that date is Rs 15,795 crore, almost a third of the premiums collected. However, it is important to note, the ministry points out, that “a majority of claims for rabi 2017-18 are yet to be estimated/approved by company”. The ministry added that in the data provided, 99% of the amounts reflected as claims paid for 2017-18 are for kharif 2017 and only 1% reflect claims paid for rabi 2017-18. The RTI response, on which our analysis is based, is dated October 10, over four months after the rabi harvest ended in May. According to the PMFBY guidelines, claims should be settled within two months of harvest. Recently, the government also announced that it would impose a 12% penalty on insurance companies which delay payments. Despite this, the Ministry of Agriculture and Farmer’s Welfare, as of October 10 2018, could not even provide the figure for estimated claims for the 2017-18 Rabi season. One of the key complaints of farmers with the PMFBY, as The Wire has reported earlier, has been that their claims are not settled in time. Farmers argue that if their crop suffers damage in one of the sowing seasons, it means that they have not earned any surplus for that particular season. Consequently, they are short of cash to sow for the next season. Crop insurance can be useful if the claims are paid to farmers before sowing for the next season begins. “See, if the rabi crop is damaged then claims need to be paid before the kharif sowing takes place. Otherwise how will the farmer sow?” said Vikal Pachar, who has been leading farmers in Bhiwani and Sirsa in their struggle against ICICI Lombard since February this year for settlement of their claims pertaining to kharif 2017. A recent performance evaluation of the PMFBY by the Indian Institute of Management (Ahmedabad) concluded that the financial management of the scheme needs to be tweaked to “ensure companies do not make super-normal profits”. 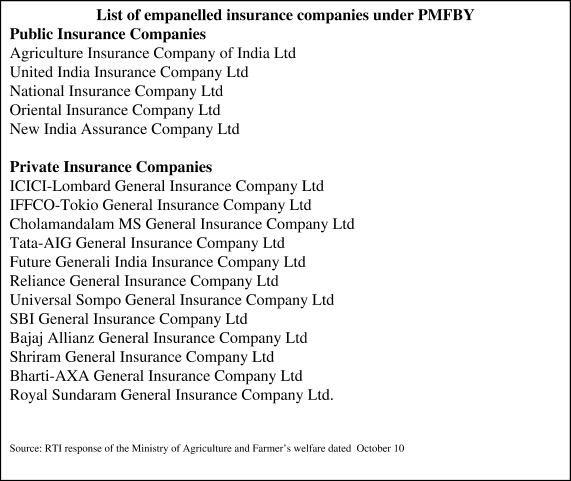 The report, supported by the Ministry of Agriculture and Farmer’s Welfare, also noted that “too many insurers (18 in 2017-18) have been empanelled”. “Many of them do not have adequate experience and infrastructure and intent of servicing public good,” it said. The report also added that in the future it would be “advisable” to restrict the number of empanelled insurance companies to just ten for “better monitoring and administration”.